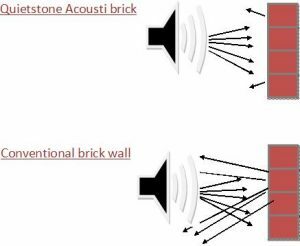 Conventional bricks reflect unwanted noise and can disrupt peoples living and working environments with high levels of reverberating noise (echoing). Quietstone Acoustic Bricks are the perfect answer. As well as looking excellent these bricks absorb sound and so reduce reverberation. They are robust and weather proof, thus ideal for indoor or outdoor uses. Perfect for hallways or shared entrance areas where unwanted noise echos around, disturbing other residents. Just like any quality brick Quietstone Acousti Brick can be used as an attractive feature inside a building. These bricks will blend in with the existing wall. The effect of QAB is truly amazing. 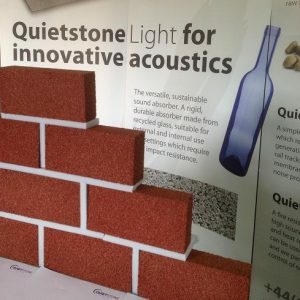 Quietstone acoustic bricks are made from recycled glass. Like many of our products this means that it has a low carbon footprint so that they contributes towards improving the sustainability of a project. This means that many of our products can contribute to increasing the BREEAM rating for new buildings. As manufactures we can produce Acoustic Brick to your specification and thus match other products or styles. Please contact us to discuss your requirements.